Richard Nichol – Variety is the spice of August! August: Hundreds of miles covered again with results in all sorts of things but you know what they say, variety is the spice of life ! Cadillac keeping up his consistency and clocking up points in both north and south Cumbria winning at all the local agricultural shows and proving he can concentrate on his job as well as being watched by half the county’s cattle sheep and spectators. Most recently jumping above 1.50 in the Puissance and taking the Fox Hunter title a swell. Storm Surge was on fire at the Thoroughbred National Championship Show at Aintree qualifying from 45 in the morning to reach the top 10 in ex the race horse jockey club novice stakes evening performance, in which he handled handsomely finishing in 6th place and went like a complete star. 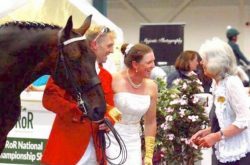 I was then asked at the last minute to enter the Glamour Stakes with fellow competitor Claire Poole where we were brought in front of the judge, none other than the A list celebrity and top author Jilly Cooper. Claire had decided it would be a good idea to portray her characters Rupert Campbell Black and Fenella Maxwell from the award winning book RIDERS which was great fun and we ended up in 2nd place. So onwards and upwards with the variety carrying on through to September.